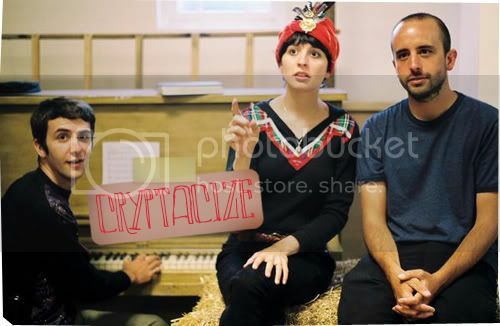 It was through Nedelle that I discovered the band Cryptacize, whose music turned out to be a delightful surprise. With former Deerhoof guitarist, Chris Cohen, making up 1/3 of the band, the music of Crytpacize culminates in a pleasant combination of both musicians’ aesthetics. The music composed by the trio are really, really spare pop tunes with minimal amount of instruments employedthroughout the record. This in effect, is what keeps the music interesting; the unexpected idiosyncrasies, the dragged out pauses, Nedelle Torrisi’s nonchalant vocal nuances, all adds up to an imaginative experience of sound. Rhythms and harmonies arrive in the littlest sums, possibly when it is only required, but are still very memorable all the same. At times the songs can get a bit wistful and melancholy such as in ‘No Coins’ and ‘We’ll Never Dream’, but this is executed without losing their lovable quirks. The band just recently released their debut album, Dig that Treasure, earlier this year which bears simple, unadorned pop treats-- certainly a treasure to be kept.